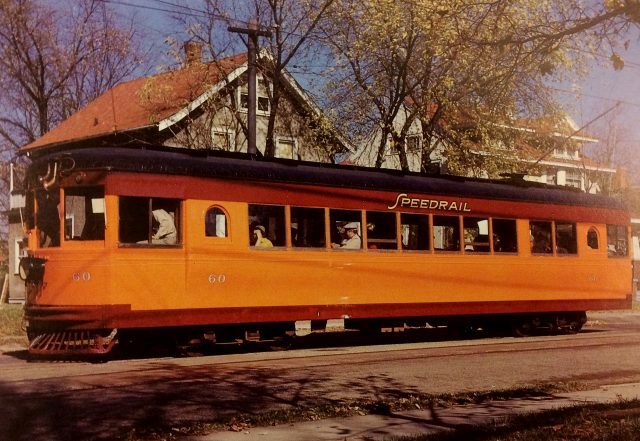 Did you know Milwaukee had a rapid transit system? It’s curious that there was so much debate over the Milwaukee Streetcar project and the proposed high-speed rail line from Chicago to Minneapolis (that would’ve passed through Milwaukee and Madison), considering we once had both. Like most American cities, Milwaukee had an extensive streetcar system in the first half of the 20th Century. 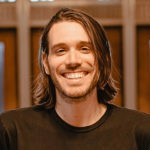 The Amtrak Hiawatha line that connects Milwaukee to Chicago takes its name from a high-speed, long-haul train service that used to run from Chicago to Minneapolis, with some engines capable of reaching 100 mph in the 1940s. 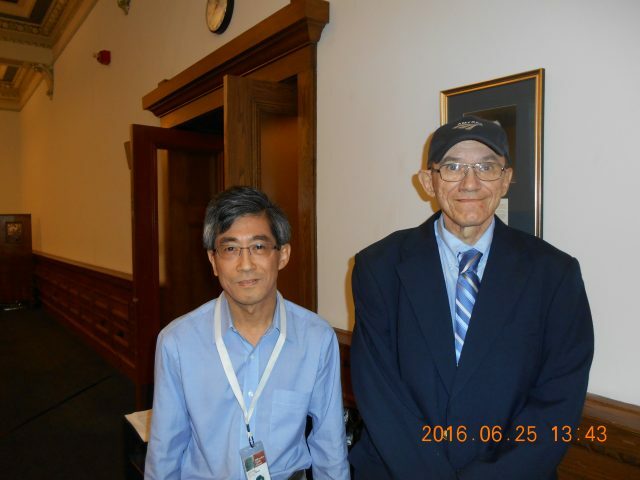 Daniel Lee of the Milwaukee Public Library and author Larry Sakar. Larry Sakar, 65, grew up on the northwest side of town, one block from the old Capitol Court mall. For almost thirty-four years he worked in the records management department of M&I Bank. 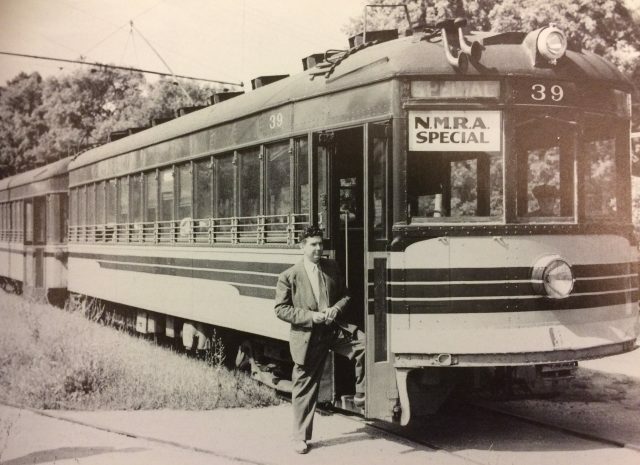 His interest in Milwaukee’s interurban transit history began one fateful day in 1965. He was with his family driving to see his grandfather at the Deconess Hospital, which operated between 16th and 17th Streets on Wisconsin Avenue until 1986. “As we were driving on the East-West freeway we made the turn alongside the high-tension electric power lines that are still there today. I can’t explain it but this feeling came over me and I said, “Something ran there and it was electric.” I’d never heard of rapid transit or Speedrail, but somehow I knew,” Sakar told me. From there Sakar dug into old maps and called the reference hotline but came up empty handed. Two years later a bulletin published by the Central Electric Railfans Association held the key to unlocking this mystery. Over the years different parts of the story were revealed to Sakar. A boon to his research came when he got in touch with the family of Jae Maeder, the owner of Speedrail in its final 22 months, and they sent him boxes full of documents Maeder left behind. All told, Sakar has been studying Milwaukee’s rapid transit history for 51 years and is incredibly knowledgeable on the subject. Jae Maeder and his motor man pose with Car 39-40 at Hales Corners. During rush hour you could get from downtown to West Junction in 20 minutes. Try doing that today. At one time or another there were interurban rail lines from Milwaukee to West Junction (about a half-mile north of the Zoo Interchange), Hales Corners, Racine, Kenosha, Waukesha, Watertown, East Troy, Sheboygan and Burlington. Interurban lines ran out of the Public Service Building in downtown between 2nd and 3rd Streets on Michigan Street, which is now the headquarters of We Energies. “During rush hour you could get from downtown to West Junction in 20 minutes,” Sakar said during his presentation at the library. “Try doing that today,” he added, eliciting laughter from the crowd. As part of his presentation Sakar showed pictures using a Kodiak Carousel tray projector. The photos (some color, some black and white) depict a Milwaukee that is hard to imagine for anyone born after the 1960s. In one wide shot of a train rounding the hill below 35th Street the city looks almost European, reminding me of a train trip I took through the Dutch countryside. Believe it or not, in 1930 Milwaukee began construction on a subway system. Work was halted during the winter and the project was eventually abandoned as the Great Depression worsened. Milwaukee also had an elevated rail track for one block, a minor but worthy note considering our southern neighbors “L”-evated prominence. During his presentation Sakar told a story about an attractive young female nurse who ran out to catch an interurban that was pulling out of its station. Remarkably, the motor man stopped the train and actually began backing up for the nurse. Unfortunately he failed to notice an express train pulling in and the two trains collided. Luckily no one was hurt that afternoon, but in 1950 there was a major accident that killed 10 riders and injured 47. Some considered the crash the nail in the coffin for rail rapid transit, but the writing was on the wall well before that accident. As was the case with most American cities, the proliferation of the gas powered automobile was the real driving force behind the decline of electric train travel. Today, most of the rail lines in and around downtown are now covered with the I-94 freeway system and the Marquette Interchange. 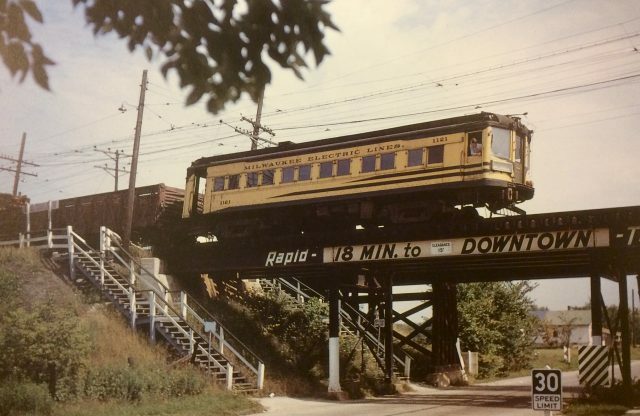 When Milwaukee’s electric rail lines shut down some stations were abandoned, while others were converted for different uses. For example, the Cedarburg station is now the home of the Ozaukee County Historical Society. One car was even turned into a playhouse for the owners kids. To learn more about the history of Milwaukee interurban rail transit pick up a copy of Sakar’s book here or from the Milwaukee Public Library. Also make sure to visit the display outside the Humanities Room at the Central Library, up through July 16th.